Blog What Will You Believe Me For? What Will You Believe Me For? What will you believe ME for? For that will determine what you receive from Me, says the LORD. I AM not limited. The sky is NOT the limit. I Made the heavens and the earth. I made the seen and the unseen. I created the known and the unknown, and MY power is over all creation. My power is beyond creation. I existed before the things that I created, says the LORD. I Am still creating and nothing is out of My control. Before you could speak, I spoke. Before you could see, I SAW! Before you could reason, I had you in My thoughts, says the LORD. The natural things that you hear and see and understand and feel and know and taste are a product of My supernatural power. My understanding and wisdom is infinite. Dare to believe, says the LORD. What do you see? What is the scope of your vision? For without vision, people will perish. You will perish. I invite you to see beyond the natural and hear beyond what your physical ears hear and embrace the unlimited power of MY SPIRIT. For will you believe in what you are experiencing in the natural, or will you see beyond? You will never rise above what you believe, but you can choose to believe in MY power and authority to heal, repair, revive, restore and renew. 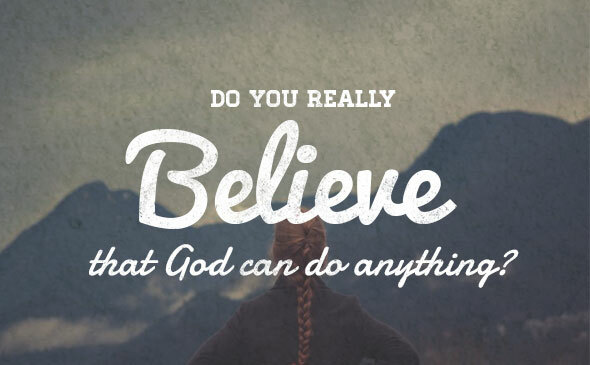 You will have what you believe me for as you stand in unwavering faith in WHO I AM and what I can and will do, and according to your faith, It will be done, says the LORD. 28 Responses to What Will You Believe Me For? I guess the question is this: exactly WHY are you believing for whatever it is? Is it to advance the Kingdom of God on this earth, or is it to get your fleshly desires met? Seems a lot of prophetic ends up feeding the lusts of the flesh. Are we asking God to give us a heart after Him? Are we asking God to help us surrender our will, so that we may exceedingly desire what pleases Him? Do we ask God to furnish the resources necessary to enable us to reach more people with the Gospel of Jesus Christ? Or is it in the end, really all about what WE want? Are we giving God lip service, or REAL service? It’s a good time to get honest with yourself , God already knows, there is no fooling HIM. You may fool yourself, or me, or others, but God knows every heart, and who it really belongs to. I am believing for employment! Amen!I belive in my Gods unlimited power! I believe that you are a great and loving God, that answers all my prayers, provides all my needs and heals all my infirmities! yes I do …he raised Larsarus from being dead 3 days!!! !